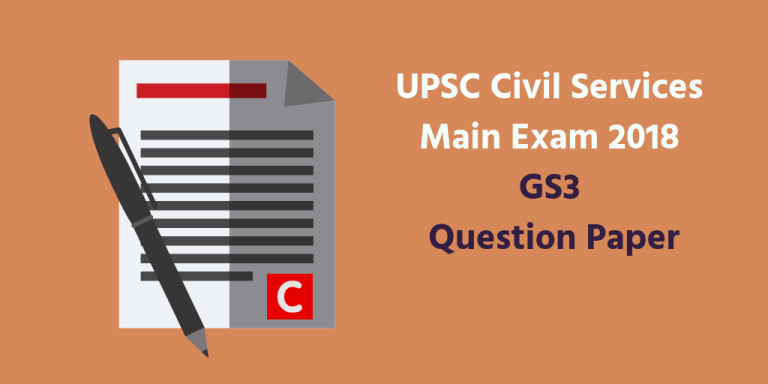 UPSC Mains 2018 – Download GS3 Question Paper – UPSC conducted the General Studies Paper 3 (GS3) Paper, as part of Civil Services Main Exam 2018 on 30-09-2018. Aspirants can now download General Studies Paper 3 (GS3) Question Paper (scroll down and use the print-PDF option). Left Wing Extremism (LWE) is showing a downward trend, but still effects many parts of the country. Briefly explain the government of India’s approach to counter the challengers post by LWE. Just like GS2, GS3 question paper too was set in the same pattern with the motto “Go back to textbooks”. Many current issues recently in news were omitted while issues or topics which were in news 3-4 years back were included in this question paper. Aspirants should note that this what UPSC has done in Prelims 2018 also. Most aspirants learn topics from the ready-made notes of coaching institutes which focus on only on the last ‘365’ days. UPSC wish aspirants get a more level playing ground, and hence they increased the span of current affears to at least last 5 years’ most important topics. Also, more traditional questions re-appeared, just as in a theoretical exam. For example, the question on Biodiversity Act 2002 or difference between NITI Aayog and Planning Commission. UPSC didn’t ask about NITI Aaayog when it was formulated in 2015, but now, in 2018, they started asking about the same. Same was the case with CPEC/OBOR. Dear aspirants, take clues from this question paper and prepare accordingly for next year. Never go with any prejudice. As you can see, this year, many questions came from Science and Technology, which was usually a less important area in previous years. UPSC can ask any type of question, and the only way to score well in any pattern is to be thorough with the conventional topics as well as current affairs (of at least last 5-year important topics). Do refer ClearIAS study materials and ClearIAS Mock Question Papers for UPSC Mains (and our archives) and see how many questions came directly or indirectly from this same. Considering that we provide only what is most necessary for UPSC, these would have added valuable marks had aspirants referred to it before the exam. We feel the most of the questions of GS3 check the conceptual understanding of fundamental issues/topics, evoking opinion from the candidates on many items recently in news. This paper cannot be called an easy paper unless you prepared holistically. Clearly, 2018 GS3 paper was not for those who did a selective study. Feel free to post your feedback about the question paper in the comment section below. I had great help from your website! I read narcotics and tribunals and many other questions from here day before exam and they were asked as it is! All thanks to you gs 3 turned out to be a sweetheart! @Raven – Thank you for the feedback. Great to know that our study materials helped you in UPSC Mains. All the best! Getting grip on atleast 5 yrs current affairs …..how can it be done ? Can you please mention the sources .